The following article is the tale of shipping the first Watusi cattle ever exported off of the African continent. This account has been narrated on tape by Walter Schulz, the father of Jurgen Schulz, one the directors of the WWA and former president of the organization. This tape was recorded in 1987 when Walter was 85 years of age and was transcribed by Maureen Neidhardt. Yes, here we are again the saga of the Watusi Cattle. Seventy-five years ago, Christoph Schulz (my father and Jurgen's [WWA director] grandfather) heard about the Watusi cattle in Dar es Salaam the capital of that time German East Africa from a government official who had just returned from the colony's most northwestern provinces, Rwanda and Urundi. In those days it took the British protectorate. In the early 1920's my father resumed his work as a naturalist and game collector in Tanganyika, formerly German East Africa, and I, 18 years old, assisted him in the capture of wild animals for the zoos the world over. I am trying to give the Watusi lovers a condensed report, how, why we undertook to collect Watusi's in their native country, motor transport, rail and ship them in two consignments, 1929 and 1930 from Mombasa to Hamburg, Germany. Each consignment I personally cared for during the voyage. In 1925, my father, I accompanying him, went to east Africa and resumed his work as a wildlife collector and captor of animals of zoological interest. Let's name it right! A wildlife captor in East Africa. We started to rebuild the big game ranch which was lost in the First World War situated near Arusha. The only governor's license to capture big game like rhino, elephant, giraffe, all the antelope, gazelles, zebra, etc. was granted to us by the governor of the mandated territory of Tanganyika. Each year in March and April large consignments of African founders left Tanga or Mombasa on board a vessel of the Holland African line arriving in May at Antwerp, Rotterdam and Hamburg. Due to the First World War and its aftermath, European zoos were in a bad shape -- exhibition and financial wise. To overcome the difficulties we offered to exhibit our animals in a special Africa show within the zoo. The takings to be equally divided 50/50. The fifty percent of the zoo's share was for animal purchase. Giraffe, zebra, antelope, ostriches, even a greater band of baboons were the attractions. To exhibit something never seen before in the zoo, my father had the idea to collect a number of Watusi cattle. One day in September 1927 we loaded our safari car, a one ton model T Ford, with supplies, petrol and made us on our way north to Nairobi and further on to Kampala. There were no roads those days, there were only tracks leading through the untouched African wild veldt with all the wild animals roaming about. We met herds of elephants, once a rhino galloped alongside us on our track and we only were able to travel at daytime because at night one could lose the track and get lost in the veldt. We came to Kampala and leaned that here were no motor roads, tracks or whatsoever there. They had found their way there well past 50 or 100 years ago and they were fine herds of Watusi cattle. We made the acquaintance with a young veterinary officer (government vet officer) and a German butcher who directed the municipal abattoirs. Both were willing to help us. To assist us, the vet offered his quarantine station to keep the animals there before export and to look veterinary like through them. Of course, we wanted the Watusi to be middle aged with good horns, perfect animals, breeding stock. So the butcher selected, out of hundreds, those he thought fit and they were turned over to the quarantine station. The vet tested them and he found that a high percentage had tuberculosis so they were returned to the slaughter house. It took almost two years until we had 21 head of cattle, 7 bulls and 14 cows - perfect, and healthy in the quarantine station. Why 21? Only 21 would go on the port side aft deck of the Dutch cargo boat we were loading. We intended to load them at Mombasa. It took a lot of organization to get these cattle shipped. They had to have stalls so the stalls were ordered in South Africa in the port of Durban and built there and erected during the voyage up to Mombasa by the carpenter and the boatmen of the ship. Since on the tropical coast of Africa there are no cattle, one cannot buy cattle food. Alfalfa, teff and concentrates are unknown as are cattle so all of the food had to be put on board in Durban. The Watusi arrived in time in the port of Kilendene, the port of the town of Mombasa. It was quite a sensation to get them out of the trucks and to lead them on the ship. We had to build a special gangway for them. It took many bumps on the heads of the personnel loading them and to myself and even feeding them on the ship I had to endure many bumps by their big heads -- horns on my head. White the Watusi were housed on the port side of the aft deck the starboard side was occupied by cases and crates, giraffe, antelope, zebras, ostrich, baboons, monkeys and other animals for the zoos. We had a fine voyage and we came to Antwerp to Rotterdam and at last to Hamburg. Everywhere it was a sensation. The dockers and the people working on the ship with the cargo coming home, telling their people of cows with horns X feet long. It was unbelievable and I suppose there was a lot of dispute and a few were called liars!! Arriving at Hamburg with our consignments we were congratulated by the state vet who had seen previous shipments of wild animals of ours and he congratulated us for this fine shipment but he said "I cannot allow the cattle to land". "We have a law and all of the other German states have a law that NO African cattle may be imported under NO circumstances. So we were still aboard. The ship was going to leave for its home port of Amsterdam and we were really in trouble, what to do with the cattle? Our agent ashore phoned all of the various state veterinary's in Bavaria, Rhineland, and everywhere. NO -- the import of African cattle was absolutely prohibited. But the free state of Sexonia had no such laws and here that saved us. The Zoo in Leipzig offered to house the Watusi and the condition was they had to stay 15 days in quarantine within the zoo in Leipzig. Oh, now we off loaded the cattle into cattle trucks and off they went to Leipzig with a lot of our other animals for exhibition in that zoo. To help get a better understanding of the trips by sea that were made with the cargo of Watusi cattle and other animals, pull a map and you will find the port city of Mombasa along the eastern coast of Africa, country of Kenya. They traveled the Indian Ocean north into the Gulf of Aden, northwesterly up the Red Sea through the Suez Canal, then traveled the Mediterranean Sea west, through the Strait of Gibraltar and finally north, through the English Channel to Hamburg, Germany, a tremendous distance. The actual distribution of cattle beyond the Leipzig Zoo where the Walter Schulz narration ends is not certain. It is known that many European Zoos have acquired Watusi cattle as have certain places in England and Sweden. The second World War intervened and it is a wonder that nay number of these cattle were survivors. They arrived finally in the U.S. in the 1960s; the exact date is documented in the records of the Catskill Game Farm, Catskill, NY. Today all full blood Watusi cattle totally evolved from this African importation. When they first arrived to North America, they were intensely inbred as a result of this closed genetic base. Herds split off to Mexico, Oregon, Canada, Florida, New York, Colorado, etc.. and continued to inbreed even more drastically. As a result of these inbred splinter herds, some are now coming back together and creating a slight out cross which has been helpful to freshen the pedigrees. Buffalo Bill, owned by Dickinson Cattle Co., LLC. of Barnesville, OH is an example of a modern Watusi. 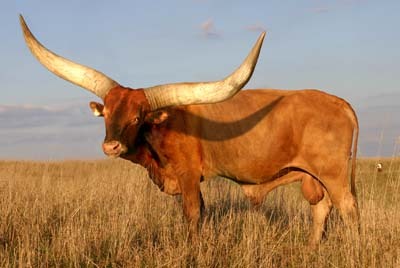 He has what is believed to be far larger horn than the original imported cattle.